Little Barningham is a small parish in the North Norfolk district. Land in the village is recorded in the Domesday Book. The book also mentions a church and a mill. The name of the village derives from Old English and means ‘homestead or village of the people or followers of Beorn’. It is suggested that the village was founded in the Saxon period. Regular metal detecting by Discovery Tours holidays and a fieldwalking and documentary survey carried out on the Mannington and Wolterton estates by Alan Davison has enabled us to record and interpret more archaeological sites and finds from the area. The earliest recorded objects are some Mesolithic to Neolithic worked flints (NHER 33384). Prehistoric flints (NHER 28033 and 28040) were also found on almost all of the fields walked in the parish by Alan Davison. 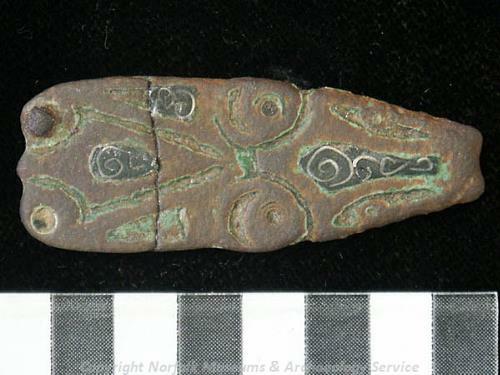 Metal detecting has recovered a Bronze Age or Iron Age collar or link (NHER 36551). Two Iron Age terrets (NHER 31861 and 33384) and a piece of Iron Age horse harness (NHER 28037) decorated with enamel have also been found in this way. Pieces of Iron Age pottery (NHER 28041 and 28538) have been recorded. The fieldwalking survey has identified two separate areas of Roman settlement (NHER 28037, 28041 and 28042). The first is a relatively early Roman settlement site (NHER 28041 and 28042). The second site (NHER 28037) seems to have been in use between the 1st or 2nd and the 3rd or early 4th centuries AD. Apart from these concentrations of activity large amounts of pottery (NHER 28538, 39390 and 39871) and coins (NHER 31861, 36556, 36551, 39871 and 39972) have also been recovered. Metal detecting has found some intriguing objects like a 1st century AD Aesica type brooch (NHER 36556), a military mount (NHER 39871) and a nail cleaner (NHER 40277). Metal detectorists have recovered the only evidence for Saxon Little Barningham. 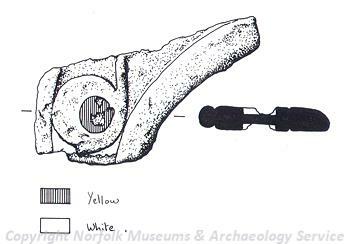 Their Early Saxon finds include parts of brooches (NHER 39528), a girdle hanger (NHER 39871) and a tinned or silvered hanging bowl escutcheon (NHER 40242). 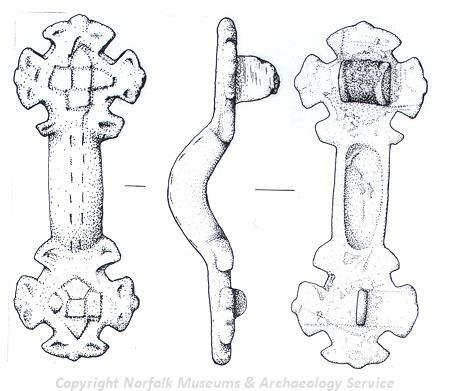 Two Early to Middle Saxon ansate brooches (NHER 40242) have also been found. One of these was imported from the Flanders region of France and Belgium. A Middle Saxon sceatta (NHER 40242) and a huge Middle to Late Saxon strap end (NHER 33384) have been recovered. Late Saxon finds include pieces of pot (NHER 28538) and a stirrup mount (NHER 39972). In the medieval period St Andrew’s Church (NHER 6692) was built in Perpendicular style. It stands on a mound at the end of the village, and probably replaced the church described in the Domesday Book. The church contained a lovely decorated pew with an inscription reading 'As you are now, even so was I, Remember death, for ye must dye' and a carved wooden skeleton figure of Father Time dated to 1640. Unfortunately the figure was stolen in 1995. It seems likely that the modern village of Little Barningham stands on the same site as that described in the Domesday Book. The site of a medieval watermill (NHER 13109) is recorded. The mill was burnt down in 1312 but some earthworks relating to it, and perhaps to a medieval manor adjacent to it, can still be seen. Earthworks of the medieval trackway (NHER 29597) leading from the village to Itteringham have also been identified. Metal detecting has recovered some interesting medieval finds including a medieval cross-shaped mount (NHER 36556), an ampulla (NHER 39871) from Walsingham and a 15th century plaque depicting a pelican (NHER 22337). The site of a post medieval limekiln (NHER 15881) is recorded near to Limekiln Farm. The Lowes (NHER 22732) is a 17th century building. Interestingly the 18th century panelling inside the house is said to come from Blickling Hall (NHER 5115). The most modern site recorded in the database is RAF Matlaske airfield (NHER 6689). This was used in World War Two between November 1940 and April 1945. It started out as a satellite airfield to Coltishall but was later used to house anti-aircraft artillery.